What little girl doesn't dream of a window seat? This big girl still does! 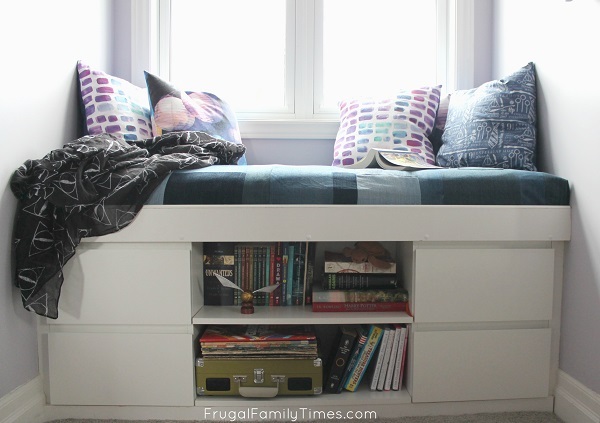 Because of the window dormer and the angled ceilings in our daughter's room - there are limited places for storage - I knew this window seat needed to do double - or triple - duty. It needed a seat (well, duh. ), shelves and drawers. 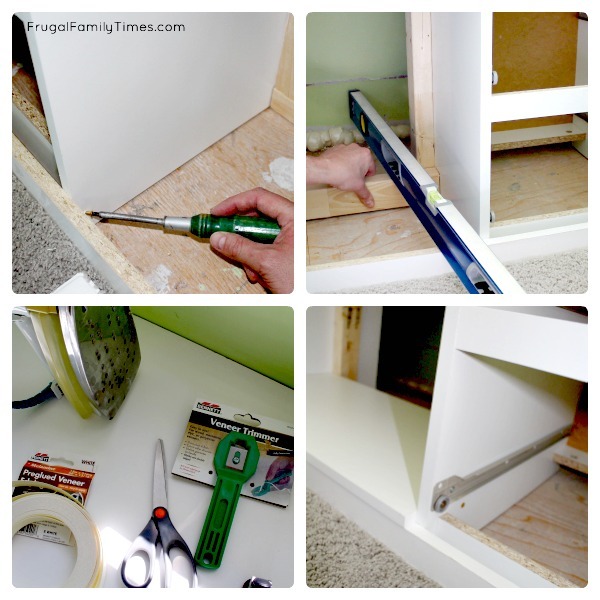 Now drawers are super handy to have - but they are also super tricky to build - especially when you're a beginner. They need to be perfectly square and engineered just right to make them actually work. We were daunted. Building drawers is beyond our current skill set. What isn't beyond our skill set? 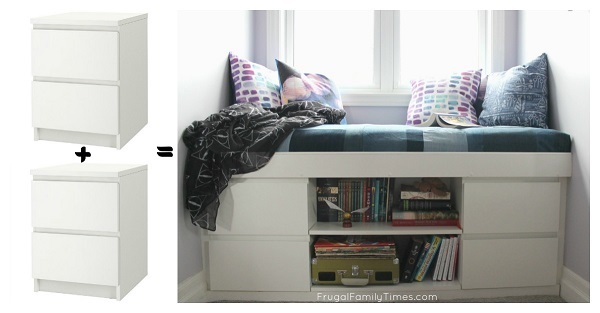 An Ikea Hack! They'd give us four drawers. Their smooth face has no knobs or pulls - so there's nothing to scratch a calf or catch a pant leg when climbing up and down. And they're pretty darn affordable. Definitely more affordable than hiring someone to build us a custom built window seat! 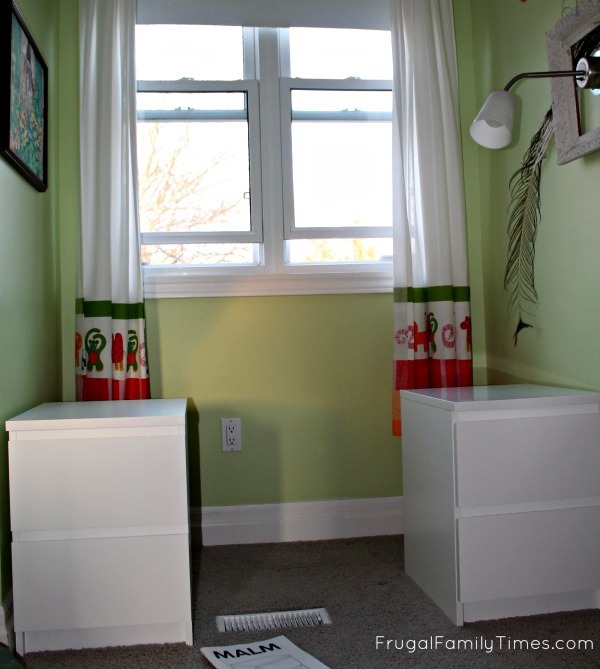 When we added the second storey to our home - which included this bedroom - the quote we were given to build this very window seat was almost $1000! Ours comes in at less than $200. Including the cushion - our original quote was just the hard bits! level, drill, bits, misc. tools etc. It took us a long time to finally write up this post - these green walls and circus curtains are dating us. We built this back in 2013! Step 1) Assemble and place your cabinet units. Move them around and see what conflicts you have with existing ductwork, electrical, etc. We chose to avoid moving the floor duct by moving the MALMs back a bit. You'll see at the end how we dealt with the electrical. Not the fun smashing "demo-day" you see on TV, sorry. 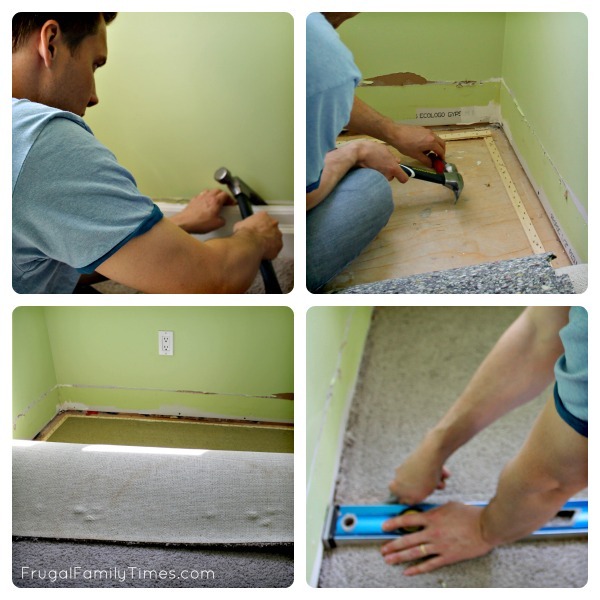 Carefully remove baseboards, measure and cut the carpet and underlay and remove the carpet tack-down strips. You'll be reusing bits and pieces to replace trim after, but if you do want to smash something, take the carpet cutoff outside and hit it with a baseball bat. 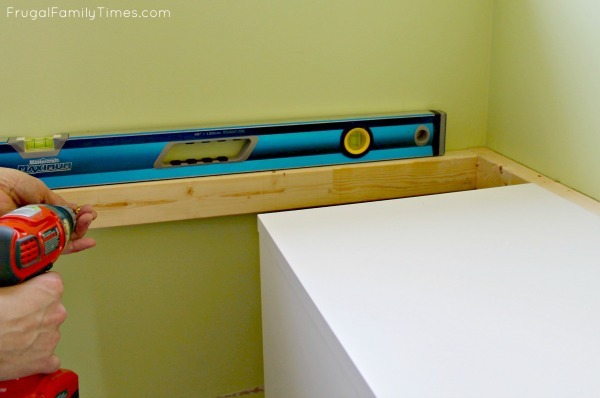 Cut lengths of 2"x3" and fit them in place, using the cabinet unit as a guide. 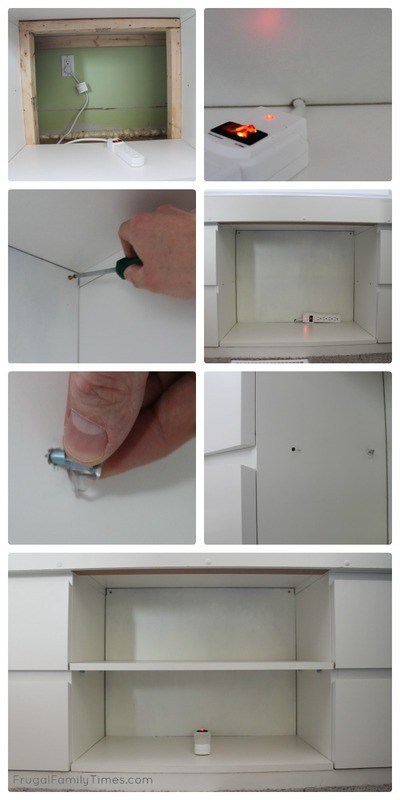 Check for level and anchor securely with screws to side walls (into studs where possible). Attach the base cabinets to them - again, checking for level and square before you drive home any giant screws. Step 4) Complete the Seat Framing. 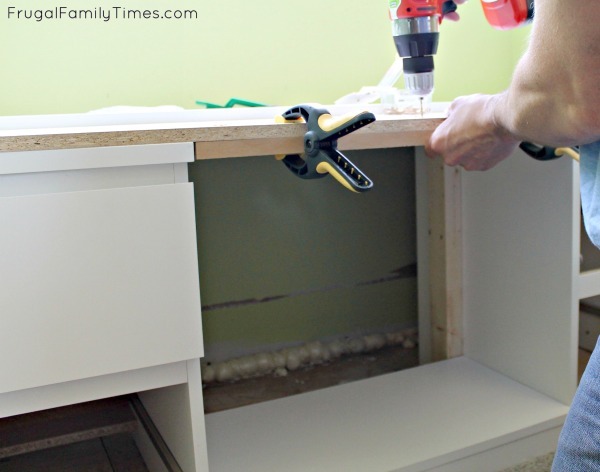 The majority of the MDF seat panel will sit on the MALM cabinets, but you'll still need a level support along the wall and a bridge piece between the cabinets to make it strong. Cut a 'cleat' for the outside wall, position it between the two side walls - checking again for level as many ways as you can. 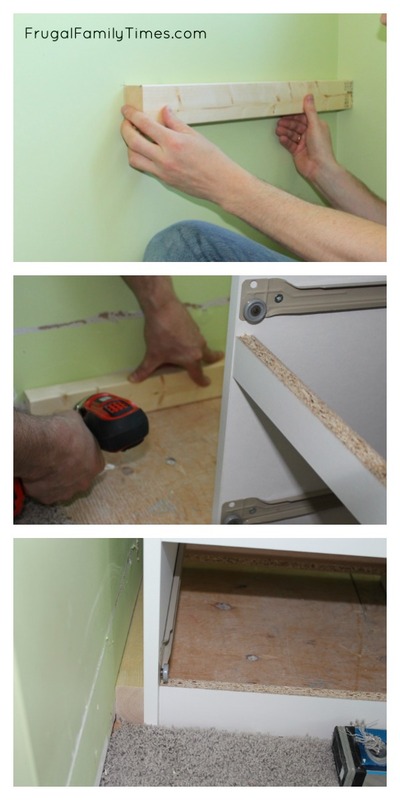 Secure it with screws into wall studs. 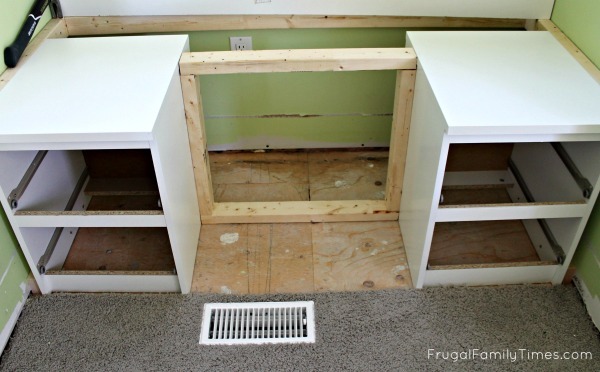 Build a small 2"x3" frame 'wall' and secure it between the cabinets. Things are starting to take shape. So far, most of what you've been working on has been behind-the-scenes stuff that gets hidden. Time to start with some finishing - so colour inside of the lines! Cut a length of MDF for the front edge/ kickplate. You can then either add the Iron-on Veneer Edge (a terrible task even with the right tools - Robin did it and I love her for that), or cut some half-round, paint it and nail it in place. We ended up using the latter method for the final part. Add another piece of 2"x3" for the bottom shelf to rest on. Cut your MDF shelf and edge it with your choice of torture. 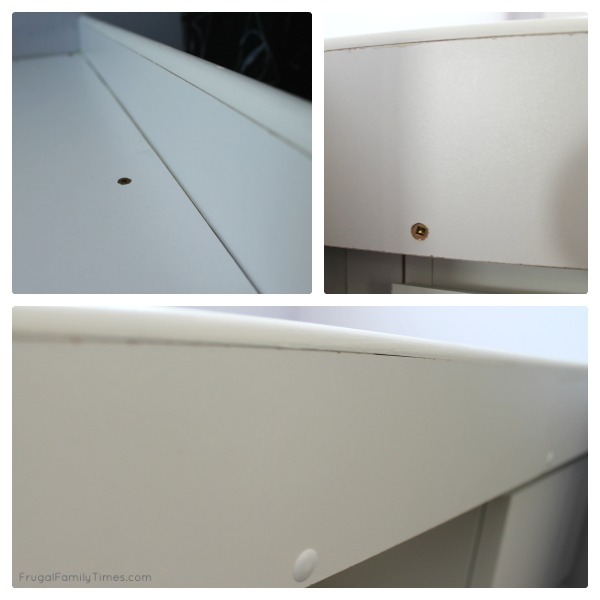 Secure the bottom shelf by predrilling and screwing through from the inside of drawer units. Step 6) Shelf back and floating middle shelving. Lots to cover here, but most of it is the straightforward and the pictures say most of it. If you have a wiring issue (like you see here with the wall outlet being hidden under the seat), make a decision. We wanted to have an outlet in the shelf so we purchased a high-quality power bar and simply bridged the outlet to the shelf with it. This is likely against building code, but it actually is under less clutter and stress than the average power bar, so we're not worried. Then shelf back is made from a piece of thin MDF, painted white and notched in a few key spots to fit. It is held in place by the wood back frame on the shelf section with two small screws that are near the top and invisible when the books are in place. Lastly, the middle shelf is a piece of MDF, cut to size and finished with a veneer edge. You drill four holes and push in some shelf supports available at any hardware store. The only part to be careful of here is to measure really carefully and drill nice, straight, clean holes (a pilot hole helps!). The supports will break out if the holes are too big, too small or rounded. You've been warned. Step 7) Cut and Install the Window Seat. This is your biggest MDF cut, so take your time and measure carefully. It doesn't need to fit tight to the sidewalls (the seat cushion will hide the gap) - leave yourself some wiggle room. You are going to add a facing piece, so the good news is you won't need to do any edging. Secure with screws or let gravity hold it down if you want access to the inside of the seat. Add an edge to the front of the seat. We used MDF trimmed with half-round, screwed into the frame in a few locations to add strength. You can use the 'plastic buttons' to cover the screws. You could also use a natural or stained piece of real wood here and it could look quite nice as an accent. We opted to keep with the simple, white we had going on already. Those pillow fabrics! 😍 They're from Spoonflower - I especially love the Mermaid Watercolor Mosiac one! I made them using super cheap fat quarters and our easy pillow tutorial. 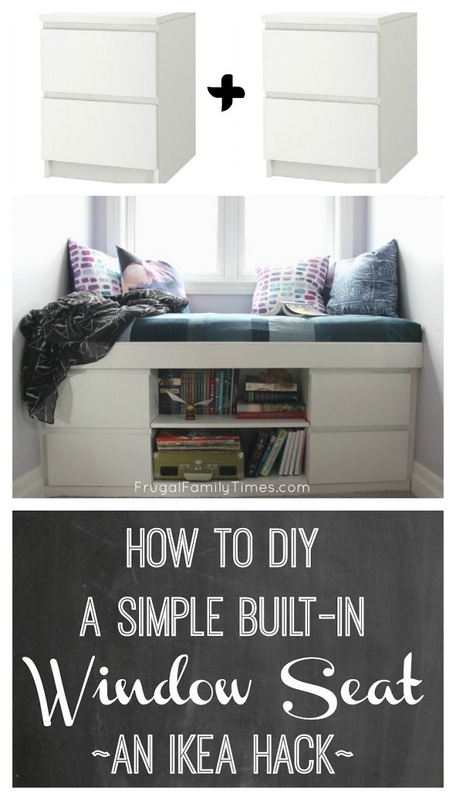 Add the DIY window seat cushion - you can find the tutorial for that here - and you're done! We made our seat cushion from old denim jeans and it turned out so well! Perfect for our teenage girl's bedroom - probably great for a boy, too! The tutorial can be found right here. 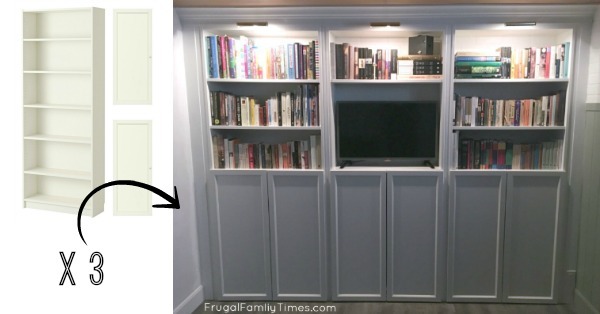 Check out our other simple and affordable DIY projects - including this IKEA hack built-in and more! Wow, what a fabulous job! 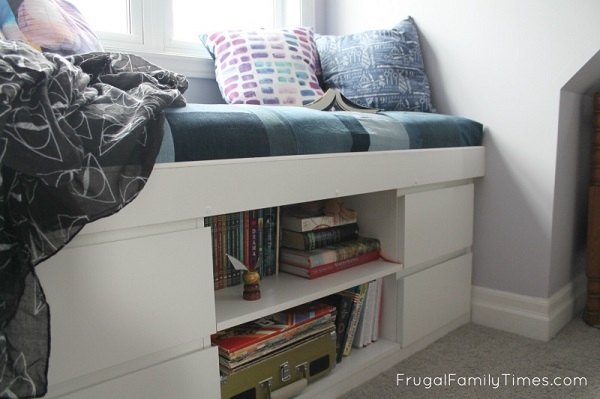 This is the perfect DIY window seat. I had a little nook like this when I was a kid and absolutely loved playing and reading in there. I hope your daughter enjoys the space. Holy Cow! That was quite an undertaking, but you really hit all the details. It's so nice to have someone blaze a trail first...I'm thinking I could actually make a built in window seat myself using your directions. Thanks for making them so thorough. And you two did a really great job...it looks fantastic. 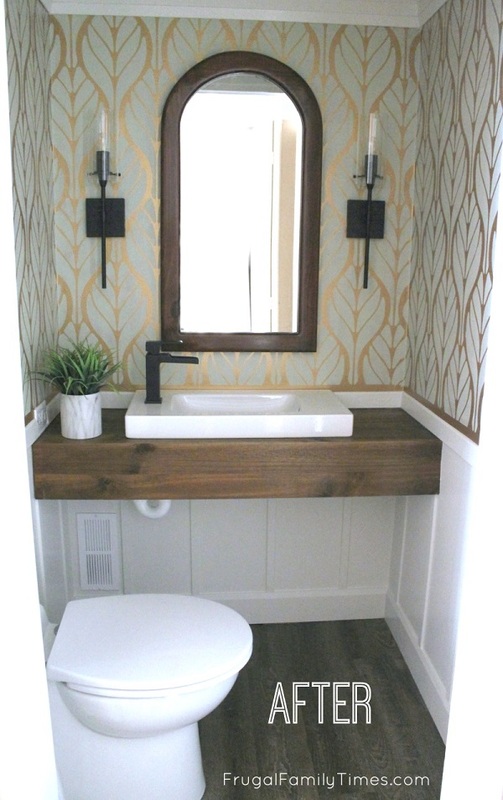 I love this windowseat - thanks for sharing! Please do share how you made the cushion on top soon. I was wondering how deep the seat is? I love this. Wow, it's fanstatic! I want this.